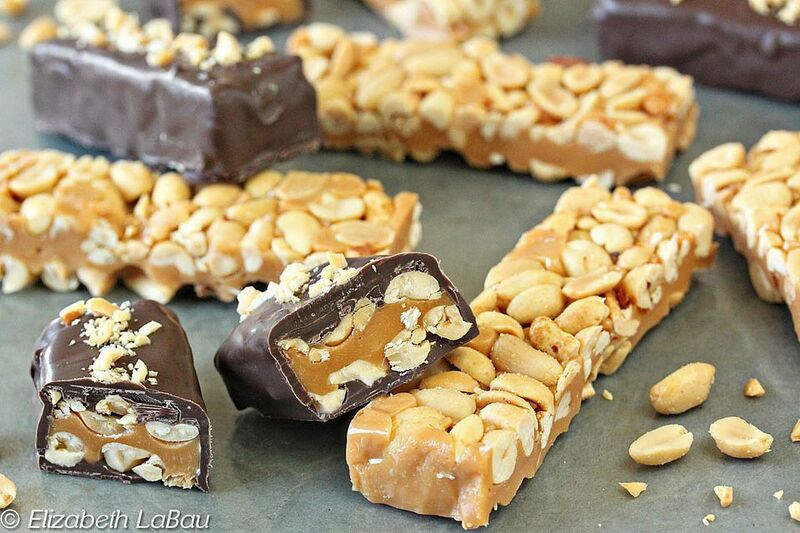 Paycheck Candy Bars are a copycat recipe for PayDay bars. These simple bars have a caramel core covered with salted peanuts. I like them plain, but I also like to take things a step further and give them a good dunking in chocolate! Try them both ways and see which you like best! Line a 9x9-inch square baking pan with foil, and spray the foil lightly with nonstick cooking spray. Scatter half of the peanuts, about 1.5 cups, on the bottom of the pan and spread them into an even layer. Combine the unwrapped caramels and cream or milk in a microwave-safe bowl. Microwave in 30-40 second increments, stirring well after each microwaving session, until the cream is melted and smooth. At first it will resist melting, and it will be difficult to stir, but as you heat it, it will smooth out and become fluid. Pour the caramel over the peanuts in the pan, and use a spatula to spread it into an even layer. Immediately spread the remaining 1.5 cups of peanuts over the top of the caramel, and gently press down the embed them into the caramel. Refrigerate the pan to set the caramel, for at least 30 minutes. Once set, remove the candy from the pan using the foil as handles. At this point, you have a PayDay taste-alike—the original candy bars are just made from caramel and peanuts! If you want to enjoy it this way, cut the candy in half, and then cut each half into slender bars. For chocolate dipping, don't cut the candy into bars just yet. Melt the chocolate candy coating in the microwave in 30-second increments, stirring frequently to prevent overheating. Spread a very thin layer of chocolate on top of the candty—this is really just to lock the peanuts into place and prevent them from falling off into the chocolate when you dip it. So do NOT make it a thick layer—try to get as thin as possible! Refrigerate the candy for 10 minutes to set the coating, then flip it upside-down and spread a very thin layer of chocolate on the other side of the candy. Once the chocolate is set on both sides, cut the candy into bars. Re-warm the coating, if necessary, so it is fluid. Cover a baking sheet with parchment or waxed paper. Use dipping tools or a fork to dip each bar into the chocolate, and set it back on the baking sheet. While the chocolate is still wet, sprinkle the tops with chopped peanuts, if desired. Refrigerate the tray until the chocolate is set. For the best taste and texture, serve these bars at room temperature.